Delivering her twins 3 1/2 months early has changed Kelley Durrant’s life. “When Ressa and Cameron were born their bodies could pretty much fit in our hands, and their skin was so almost translucent looking,” their dad Leo Durrant recalled. Sadly, Ressa passed away from an infection three weeks later. Her parents remember saying goodbye to their tiny daughter with the determined personality. Committed to the cause of helping other babies who struggle to live, Kelly pumped — in memory of her daughter — at work and even while on vacation. Her determination was so strong that Saturday she marked a milestone with her final donation to Mother’s Milk Bank of North Texas — 100 gallons of breast milk. 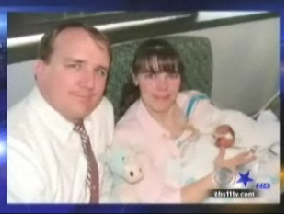 The Milk Bank said that Kelly’s donation — 17 months worth of milk for a baby — is unprecedented. The giving mom is just happy that she could help other babies and give them the chance to survive or a little bit of a boost.